Communicate with other users right from within the Zimbra Web Client. Invite and remove users from the buddy list and assign nicknames. Start chatting with a simple click. Show your mood in chat with emojis. Switch between four status messages: Available, Away, Do Not Disturb or Invisible. Enable the Zimbra Chat Zimlet, and your users are ready to start chatting. Calendar wizard finds optimal group meeting times and is interoperable with Microsoft Exchange. Import any iCal feed or Google calendar into Zimbra Calendar to create a master free/busy view across work, club and personal calendars. Hovers are simple yet powerful ways to save time. If someone sends an email suggesting a meeting date, simply mouse over to preview your calendar on that day. If you have sent an email and change your mind or want to change something with a quick undo, then this Zimlet is for you. This Zimlet creates a client-side interface for Thinkfree Office. The ThinkFree Server can be easily integrated with the Zimbra web client to provide core office productivity to the mail and briefcase repository. The resulting product is comparable feature-wise to the typical Microsoft Office stack but offers more flexibility and a lower TCO. This Zimlet brings?to your Zimbra Web Client all the capabilities and power from ownCloud. ownCloud is a self-hosted file sync and share server. It provides access to your data through a web interface, sync clients or WebDAV while providing a platform to view, sync and share across devices easily. It’s no longer necessary to open WebEx to schedule a conference, it’s done for you and the meeting information is included in the Calendar invites you send. This Zimlet lets you attach notes to emails, such as:”I need to confirm dates” or “John’s phone # is 650 350 1122”, etc. Once you attach a Sticky Note, it automatically opens the next time you open that email. Using freely available reference Zimlets as well as Zimbra and 3rd party APIs, you can quickly build and deploy new Zimlets that are tailored to the specific workflows that will streamline your business. For more information, please see the Zimbra Wiki on Zimlets and the Zimlet Developers Guide. Zimbra has a large open source Community that can provide guidance on how to extend Zimbra functionality as well share code based on Zimlets that have been contributed to the Community. An excellent resource for more information is the Zimbra Forums where there are areas dedicated to development and Zimlets. Another excellent resource for both finding and sharing Zimlets and other custom Zimbra add-ons is the Zimbra Gallery. Zimbra customers and Community members often place their finished creations here for the Community to leverage for their own deployments. Zimbra Collaboration Server ships with ten Zimlets pre-configured and many more that administrators may deploy to their users. Zimlet availability is configurable per user / group using Class-of-Service (CoS). Attach Contacts – Attach contacts when composing a new message. Email Attacher – Attach email messages when composing a new message. Dates – Highlights dates in email body and previews associated appointments on that day and creates a link to the calendar. Drag-n-Drop Attachments – Drag-n-drop file attachments from the computer desktop when composing an email message. Email Contact Details – Highlights and previews associated contact details for an email address in your Address Book. LinkedIn – Shows LinkedIn search result for a given email address in a message header. Social – Access and manage Twitter, Facebook, Digg and TweetMeme from Zimbra. Search Highlighter – After a mail search, this Zimlet highlights search terms with yellow color in email bodies. URL Links – Highlights Web URLs for linking in email messages. WebEx – Easily schedule, start or join WebEx meetings. Add a WebEx event to an invite in Zimbra. 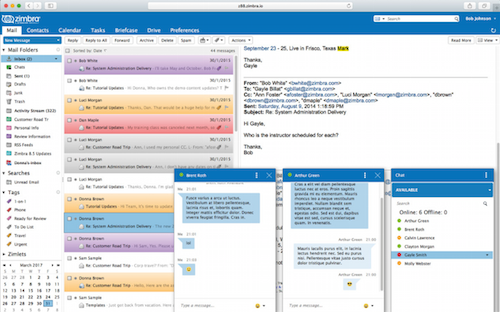 What is Zimbra Collaboration Open Source Edition? Since the inception, Zimbra has been a community. All of our Zimbra Collaboration Open Source Edition software, documentation and innovation has been created, tested, used, and discussed openly by people like you participating in our Open Source Community. Our contributors diagnose bugs, fix bugs, translate programs, submit patches, point out deficiencies in documentation, answer community questions, submit killer applications, alert us to something that needs tweaking, and write new software. No matter how you contribute, we welcome new ideas and contributions for the advancement of greater shared knowledge and a better Zimbra Collaboration product. So jump in! Zimbra Collaboration Open Source Edition is available for you to test, evaluate, deploy, customize and improve. Special Note: Zimbra recently made key changes to its open source software licensing in order to build an even stronger foundation for community-powered innovation. With the release of Zimbra Collaboration 8.5, Zimbra officially moved to Open Source Initiative-approved licenses. The Zimbra Open Source Edition Web Client Code is released under the Common Public Attribution License, version 1.0 (CPAL v.1). The Zimbra Open Source Edition Server Code is released under GNU General Public License, version 2 (GPL v.2). The Zimbra Open License Community Zimlets Code is released under the Common Public Attribution License, version 1.0 (CPAL v.1). Versions prior to version 8.5 will remain under the Zimbra Public License 1.4. By moving to OSI-approved licenses, Zimbra hopes to increase contributions from the open source community and increase compatibility with other open source projects, so that customers, partners, and end users receive greater benefit from integration across the open source software ecosystem. ZCS server downloads are intended for administrators and developers. First time installing? Use the latest 64-bit platform where possible on your new systems. If you have questions about which product edition best for you, or wish to purchase a subscription plus support to the Zimbra CollaborationNetwork Edition, please contact us.
? For single server installations, a minimum of 8GB of RAM is required.
? For multi-server installations, contact Zimbra sales for recommendations. *Temp files space: The zimbra-store requires 5GB for /opt/zimbra, plus additional space for mail storage. The other nodes require 100MB.